On the second day of the Jalsa in Britain, we relate Allah’s countless blessings. Facts and figures of different departments are presented, progress of jama’at is reported and I talk about the incidents related to the statistics. In that one or one and a half hour, neither the details of the figures can be given nor all the incidents can be related and the notes that I bring with me to read, go back as they were. Tehrik-e- Jadid has started publishing those statistics in the form of a book on yearly basis. As far as the incidents are concerned, I mention them at different occasions. Today as well, I will relate some of these happenings. They show how Allah moves the hearts of the people living in different countries. Some are told the truth through dreams, at some places a book or a piece of literature becomes the source of propagation, somewhere, opposition to Ahmadiyyat makes it spread and sometimes the conduct and behavior of Ahmadis attract others to Ahmadiyyat. Then there are occurrences that show us the marvelous backdrops of the faith and belief in Ahmadiyyat of the people living in faraway places. Regarding the training of the children, there is a remarkable change in their lives due to the acceptance of Ahmadiyyat or its company and people do feel it. Briefly, if we consider judiciously, we can say that though we are trying to propagate the true Islam under a system, but the fruition is a lot more than our efforts. It is true that with reference to the Promised Messiah (peace may be upon him), spreading the message of Islam and opening the hearts of people for it is being done by Allah Himself. When Allah said, “I will cause thy message to reach the corners of Earth”, then Allah is doing much of the work Himself. Every right-minded Ahmadi is cognizant of the fact that the progress of Ahmadiyyat is taking place not due to our efforts and resources but it is happening due to the blessings of Allah. Instead of Tabligh, I present some events. The missionary from Conakry, Guinea writes that a two-page leaflet has been distributed far and wide in the country. We are receiving phone calls from far flung areas of the country that the people used to listen from their fore fathers about Imam Mahdi (peace be on him) and the Promised Messiah (peace be on him). Now after reading your leaflet, we are eager to meet you because we feel that it is time now that the Muslim Ummah needs a reformer. This is how due to God’s blessing we came into contact with many people and they did Bai’t and joined Ahmadiyyat. Leaflet just provided the contact but God had already prepared the hearts. The wise people feel that this is the age that needs a reformer, a messiah, a Mahdi. Who can say that in such remote areas the news of Ahmadiyyat reached through someone or they accepted Ahmadiyyat under someone’s influence. Then Tanzania which is in eastern part of Africa, a missionary wrote from the city of Dodoma that during a Quranic exhibition a lady came to our stall and surprisingly asked if that stall belonged to Muslims. After acquainting with the books, she bought a book that had content with reference to Christianity. The same lady came next day with her husband, both in military uniforms as they were military personnel. The lady informed that she was a Muslim and her husband was a Christian. She had been married for a long time and was trying to educate her husband about Islam but could not get good enough material about Islam to convert her husband. When I came to your stall yesterday I felt that I had come to the right place. I bought a book and gave it to my husband. He got answers to many questions and I hope that the remaining ones will be resolved today after talking to you people. The missionary had a long conversation with them and her husband and they both accepted Ahmadiyyat the true Islam after doing Bai’t. The burning desire to get husband converted to Islam attracted the blessing of God in such a way that she came there and both of them entered the fold of the true Islam. It is not only in Africa that the messages are reaching via leaflets or propagation efforts or curiosity is limited to the people in Africa and third world. our missionary here in Haresfield, UK writes that leaflets were distributed in a nearby town and after some time fifty English men and women rented a coach and came to our mosque to attain knowledge about Islam. They were given a presentation about Islam and Ahmadiyyat and a Q/A session was held in a 2 ½ hour program. Coming of the people here by themselves is a sign that Allah Himself is moving the hearts of the people. On the one hand the Muslims themselves are bringing bad name to Islam resulting in non- Muslims’ crossing the limits and on the other hand Allah is stirring the atmosphere to attract the attention of people understand the real Islam. Then we observe how Allah has strengthened the faith of masses in far flung areas of the world and created a sense of sacrifice in them. Amir of Benin writes that a new mosque was built in Sofo with the loving and selfless participation of men and women. The local traditional President said that the mosque is the standard bearer of peace for the populace. The Chief declared the mosque to be the light tower and guide for the council of the area. As the general public of the area belong to paganism, their chief who is also known as king, said that he was also a pagan before but due to Ahmadiyyat, now I believe in one God. 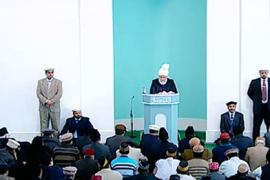 He further declared that Ahmadiyya community is the embodiment of love and truthfulness and though I am a king, there is a great emperor above me whose worship is incumbent on all of us. It is only God who is creating this spirit that the message of Ahmadiyyat and the philosophy of Islam is true. This is the real education and Islam that Ahmadiyyat is introducing and causing pagans to accept One God. Another official of the area disclosed that when propagation of Islam started in that region, and people were attracted to Islam and Ahmadiyyat, general public expressed their concerns that these people have come there to murder us and kidnap our children like other terrorists. We deputed young men to keep awake in the night and watch the Ahmadis to ascertain if they were engaged in illegal activities. Now after a long investigation and experience, we have determined that this Jama’at intends only to establish peace. The opponents of Ahmadiyyat try to bribe the people away from Ahmadiyyat but Allah has been strengthening the faith of these less educated or even uneducated folks of faraway places with His grace. One of our local Muallam writes some people of an area accepted Ahmadiyyat and established a Jama’at there. These people were Muslims before and were under the influence of a city Imam. A continuous link was kept with these people. Classes were started. The holy Quran, prayers and other things were taught. When the Imam of the region came to know it, he started talking against the Jama’at. He said that Ahmadis are not Muslims, they are infidels and you should leave them. The new converts told him that they had been there for a long time and nobody helped them with the religious education of their children no one ever asked about their wellbeing. Now that the Ahmadis have started teaching the Quran and prayers to our children, you say that they are not Muslims. It doesn’t make sense to us. The people who teach us the holy Quran and prayers…we cannot call them infidels. By grace of Allah these people are steadfast and have been able to build a mosque there as well. Another Muallam from Benin writes that during a radio program, they received a phone call from a man named Eric who invited us to visit his village. As we were noting down the address, the call dropped without completion. One day when we reached a village Sange Pota, a man stood up and called the people to come around quickly for those people that we listened to on the radio were there! The propagation efforts there, more than two hundred people did the Bai’at and a Jama’at was established. Only a few days have gone by…now listen to the state of their firm faith. Two days after the Bai’at, Eric’s house wall fell down during a rain and wind storm, and his 8-month old child died under the wall. The idol worshipers said to him that he started experiencing difficulties right after joining the Jama’at. He replied that he believed in the truth, he will never retreat. He is Ahmadi and will stay Ahmadi till he dies. This is firmness of faith and devotion to Unity of God that is being entrenched in the hearts of the people through the Promised Messiah (peace may be on him). He also gave a part of his land for Namaz center and himself built a temporary structure to start the Quran classes. This is how Allay paves the ways to spread Islam. The missionary from Tanzania writes that in a village in the Shiandari region, a new Jama’at was established. A Tabligh program was being held in a nearby village. A lady from the previous village Moti Ho arrived there and after listening to the presentation requested to bring the message of Islam to her village. She further said that there are some Muslims there and they have a mosque as well, but their version of Islam is quite different from what you are presenting. Consequently, when our Muallams went there and presented the message of Islam and Ahmadiyyat, 95 people along with their Imam accepted Ahmadiyyat. When the Sunni Maulvi of the area learned that, he reached the village and told them that they have been misled and have gone astray, and that those people were not Muslims. The new converts replied that they had accepted Ahmadiyyat thinking it to be true Islam and that they will not listen to him. Then he asked the local Imam to see him in his office. The Imam also refused to comply. By grace of Allah these new converts are strengthening their ties to the Jama’at and have joined the donation system as well. These are poor people and cannot afford to pay for travel. They contributed money and sent their representative to the Shoora. Because of them Jama’at has been established in two of the adjacent villages. Similarly, a Jama’at was established in another village in Shianga, Tanzania. For many years, the Muslims had been there and had a mosque as well. When our Muallams went there, held a program, 130 people along with their Imam, did the Bai’at and joined Ahmadiyyat. Mr. Edhi, one of their elders, came to Shoora and was impressed by the strong system of the Jama’at. He said that he had been a Muslim since 1993, but now they are lucky that they were blessed with joining the Jama’at. Burkina Faso is another French speaking country of Africa. The missionary from there states that this year they were able to build a beautiful mosque in Tenkodgo. When Ahmadiyyat was introduced in that village, the people had done the Bai’at with their Imam. At that time the opposing Maulvis offered to give their own beautiful mosque to them if they would abandon Ahmadiyyat. They held on to Ahmadiyyat and at that time preferred their own modest mosque to the opponents’ grand mosque built with Kuwaiti money. Today they have a brick mosque built along the highway and the news has reached all the adjoining areas and the whole city. Many dignitaries, Imams and kings came at the inaugural ceremony. One of the opposing Imams asked three times if what he observed was Ahmadiyyat. Then he declared that what he had heard about Ahmadiyyat was all lies and today he can say that No Islam can be truer than Ahmadiyyat. So, those who are truly Muslims, those who want to see Islam pervading throughout the world, cannot think outside Ahmadiyyat. The Islam that was destined to spread through the Promised Messiah (may peace be on him) and is spreading, cannot be seen anywhere else. The emir of Benin writes that our mosque was built in Borikon region. Ever since the Jama’at was established there in 2015, and 245 people had joined Ahmadiyyat, they are facing continuous opposition. The new converts are steadfast in their faith despite stiff antagonism from relatives and Imams of the region. When the building of the mosque started during this year, the non-Ahmadi Mullahs openly opposed the construction and said to the Ahmadis that it was better for them to say the prayers in a church rather than praying in an Ahmadiyya mosque. Even the brick-layer who was constructing the mosque was threatened to refrain from building the mosque. In spite of all that opposition, the beautiful mosque has been built with two 13-meter tall minarets and 375 people can offer prayers there. Then we see how Allah guides through dreams. San Pedro is a region in Ivory Coast. In a city of this region, a friend Zona Ahmad did Bai’at because of a dream. He was a Christian before and after accepting Islam, joined the Wahabi sect. He relates that after accepting Islam, he learned prayers and started offering them in the mosque. In the same period, he saw a saintly person twice in a dream. He further said: The very first time I came to know in the dream that that was a prophet of God. I thought I was shown the Holy Prophet (may peace be upon him) in my dream. Once again I saw in my dream the picture of the same person appearing on the T.V. and someone was reciting the holy Quran at the same time. Below the T.V. was written ‘Mission Islamic Ahmadiyya’ in French. After this dream I asked about Ahmadiyya Jama’at from the Imam of the mosque. First he tried to beat about the bush. When I was persistent, he told me that Ahmadis are not Muslims. What was wrong with me? Someone had misled me. Why was i bent upon destroying my Islam? There was no Ahmadi in that town. He then told the Maulvi that nobody had misled him and he had not even seen any Ahmadi. He was only shown the path of Ahmadiyyat by Allah. He continues to relate, “I got worried when I came home. Who are these Ahmadis that are being called ‘non-believers’ by the Imam? Then I prayed to God to show me the right path. I kept on asking the people around me about the Jama’at but could not get any connection. One day a friend of mine told that there was Ahmadiyyat in another city. I found my way to the mission house in that city, where missionary introduced me to Ahmadiyyat. There I was amazed to see the picture of the Promised messiah (may peace be upon him). I was told that the man in picture was the Mahdi and the Promised Messiah (peace be upon him). I accepted Ahmadiyyat then and there and told the missionary that that was the saintly person I saw twice in my dream!” He told the missionary that he filled the Bai’at form then but actually he had accepted Ahmadiyyat when Allah guided him in the dream. Now he has joined the donation system and prays regularly at home and offers Tahajjud as well. He is spreading the message in the area and to the Imam as well. These are the works of Allah. This is how he is Guiding. On the other hand, there are people who are drowned in doubts because their intentions are not good. Missionary-in charge from Belgium writes that a new convert Mr. Idrees who knew nothing about Ahmadiyyat when he saw a saint in a dream. About two years ago when he was changing channels of the TV that he looked at the Al-Arabia MTA and sew the picture of the Promised Messiah (may peace be on him) and remembered his dream. He had seen the same saint in his dream. He started watching MTA regularly and in this way he was inclined toward Ahmadiyyat. He found the address of the Jama’at himself, reached the Mission house and said that he wanted to do the Bai’at. When asked to investigate before the Bai’at, he said that he has already found the clarifications. He further told that he was satisfied and did the Bai’at. Mali is a country in Africa. An elderly person came to the mission house there and told that he wanted to do Bai’at. When the Murabbi sahib asked the reason for that he said, “Last night I was listening to your live radio program. Some people were cursing the Jama’at via live phone calls. I prayed to God during the program to guide me toward the people who were right. I fell asleep while praying and saw in the dream that there was missionary in charge on one side and the opponents on the other side. They are engaged in arguments. When the opponents could not answer the missionary, they throw him in a ditch and start pouring dirt on him. At that time a saint appears from the sky and says that he was Mahdi and extending his hand saves the life of that missionary. Then I awoke and now I have no doubt about the truthfulness of Ahmadiyyat. That is why I have come to do the Bai’at”. Murtaza sahib was a Muslim in France but not an Ahmadi and lived in an area where there was no Ahmadi. He did the Bai’at this year. He told, “I read a book titled Masihi Dajjal when I was 8 or 9 years old. Three groups were mentioned in that book: the emancipated ones, the cowards, and the martyrs. I prayed to God to include me among the emancipated ones. After sometime we migrated to France. One day I watched MTA and got introduced to Ahmadiyyat. I began watching MTA regularly and was convinced of the truthfulness of Ahmadiyyat but did not do the Bai’t. Due to some illness, I did not have any issue. I started reciting the prayers of the Promised Messiah (peace be on him) told on MTA. By Allah’s grace I was blessed with a baby though the doctors told had me that it was not possible for me to have an offspring. So, in 2016, after witnessing the sign of the truthfulness of the Promised Messiah, I did the Bai’at. Training the children, imparting Islamic education and making them a useful being in the society is also part of our job. The training that we give to children also impresses the people. In Sierra Leone in the Bo Jama’at, our Muallam started taking children’s classes. A non-Ahmadi child was also attending. One day that child’s father, Abdul, who was not Ahmadi was performing ablution. His 10-11 years old son told him that he was not performing the ablution properly and demonstrated the correct way before him and told him the ablution prayer as well. He was very happy that his child learned all that from the children’s class. He further said that he was giving that child to the Jama’at for training as they wished. This must be remembered by all the parents and by the system that training the children is a great responsibility given to them. It also opens new ways of Tabligh and training for us. Discharging neighbor’s rights is a basic principle of Islam, mentioned in the holy Quran and emphasized by the Holy Prophet (peace be upon him). Our missionary writes from Ivory Coast that a new convert, Azmi sahib has joined the Jama’at by doing the Bai’at this year and he relates his story: Before joining Ahmadiyyat, I used to offer prayers in the non-Ahmadiyya mosques. I had heard so many negative things about the Ahmadyyat that despite Ahmadiyya mosque being close to my house, I would rather go to the other mosques to say prayers. Once I got very ill and the Imam of the Ahmadiyya mosque came to ask me about my health. After regaining health, I started going to the Ahmadiyya mosque to say prayers. I got interested in the Jama’at after listening to the sermons and other speeches. I read the books of the Promised Messiah (peace be on him) and was convinced that if there was a Jama’at is following the Quran and Sunnah of the Holy Prophet (peace be on him), then it is only the Jama’at Ahmadiyya. So I did the Bai’at. Seeing me, my children also got interest in the Jama’at. My son is studying in the secondary school. I wish that after completing the secondary school, he gets admission in the Jamia Ahmadiyya and serves the faith after devoting his life. By grace of Allah, the way the opponents are trying to impede our ways, He is providing means to stifle their arguments and increasing the faithfulness of the new converts. The emir of Yadgir, Karnataka, in India writes, “Extreme opposition was started by the non- Jama’at people, last year. The opponents brought their scholars from outside to deliver speeches there. Dirt and baseless accusations were leveled against The Promised Messiah (peace be on him). Public was instigated against the Jama’at. Thus, the senseless people behaved very badly with the People of the Jama’at. Pamphlets were published against the Jama’at. In those days, an Ahmadi who was completely cut off from the Jama’at was harassed by the opponents and was used by the them against Ahmadiyya Jama’at. He was made to wear garlands and paraded throughout the city. A great fuss was created in the city by announcing that they had converted a Qadiani non-believer back to Islam. Lies were published in the newspapers and much opposition was created through that person toward the Jama’t. He also used foul language against the Jama’at. When the Jama’at asked him to explain his behavior, he said that he did not say the things published in the newspapers. He further said that he is with the opponents due to some indescribable reasons. Just a year had passed when he came under God’s curse. He was healthy but all of a sudden swooned to the ground and was paralyzed on one side. His son is a devout Ahmadi. The opponents tried to pressurize him as well but he is steadfast and did not even say his father’s funeral prayers. May Allah strengthen his faith. Amen. These are a few incidents of Allah’s blessings. May Allah help us to always absorb His blessings and enable us to fulfill His rights. The favor that God has done to us that He made us Ahmadis, He may grant us steadfastness in that and keep on raising our status in faith and belief. Amen.